Cooperatively breeding species are deﬁned by the presence of individuals who help in rearing the offspring of others. This seemingly altruistic behaviour has been difﬁcult to deﬁne and the help provided has not always resulted in a reproductive advantage to the recipient. We examine maternal rearing strategies in the common warthog, Phacochoerus africanus, a facultative, cooperative breeder that displays variation in the number of reproductive and non-reproductively aged individuals in a group. We compare rearing strategies in adult females to assess whether group size or group composition increases the production and survival of group off- spring. We found that although the number of offspring observed in groups with multiple adult females was larger than the number of offspring observed in groups with only one adult female, the average number of offspring observed per female was similar. 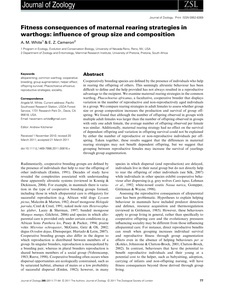 Additionally, maternal rearing strategy had no effect on the survival of dependant offspring and variation in offspring survival could not be explained by either the number of reproductive or non-reproductive individuals per off- spring. Taken together, these results suggest that the differences in maternal rearing strategies may not beneﬁt dependent offspring, but we suggest that grouping between reproductive females may increase the survival of yearlings through group augmentation.